INTRODUCTION: Standard treatment for gastrointestinal stromal tumor (GIST) of the stomach, if localized to the primary lesion, is wedge resection with a clear surgical margin. Laparoscopic approach would be technically feasible, but oncologic validity is unknown to date. 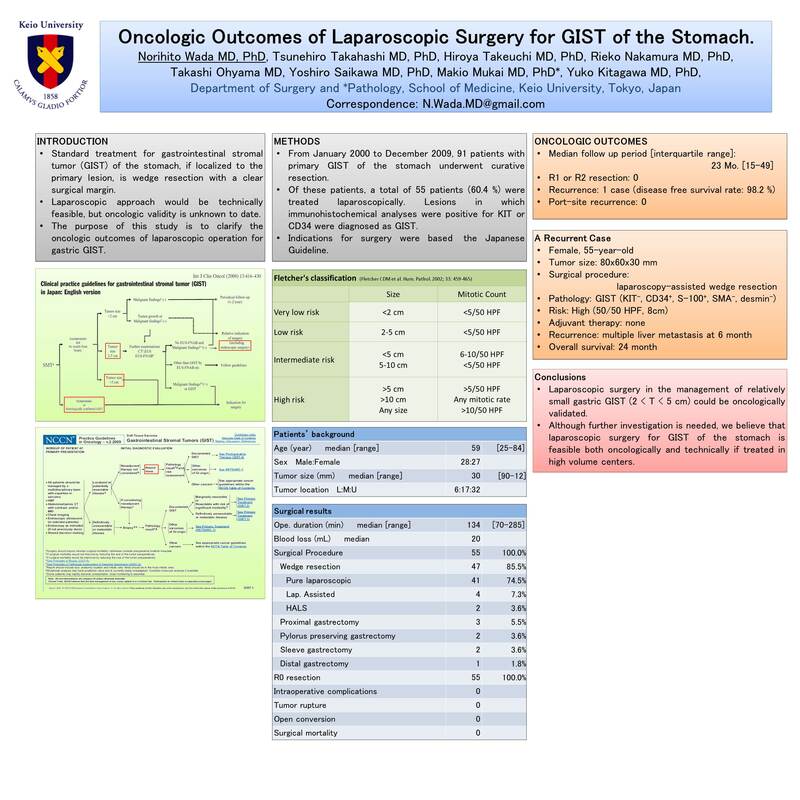 The purpose of this study is to clarify the oncologic outcomes of laparoscopic operation for gastric GIST. METHODS: From January 2000 to December 2009, 91 patients with primary GIST of the stomach underwent curative resection. Of these patients, a total of 55 patients (60.4 %) were treated laparoscopically. Lesions in which immunohistochemical analyses were positive for KIT or CD34 were diagnosed as GIST. Resected tumors were grouped according to the Fletcher’s classification. Indication for laparoscopic approach is a tumor 2 to 5 cm in size. Tumors larger than 5 cm and close to the cardia or pylorus were excluded from wedge resection. RESULTS: Patients were aged 25 to 84 years, with a median age of 59 years. Wedge resection was performed in 47 cases (85.5 %). Among them 4 cases were treated with laparoscopy-assisted surgery, 2 were hand-assisted laparoscopic surgery (HALS) technique and the others (n=41) were pure laparoscopic surgery. Three patients were treated with proximal gastrectomy, 2 were with pylorus preserving gastrectomy, 2 were with sleeve gastrectomy and 1 was with distal gastrectomy. Laparoscopy assisted approach was used for these procedures other than wedge resection. The median follow-up period was 23 months with interquartile range, 15 to 49. Only 1 patient had recurrent disease (disease free survival rate: 98.2 %). This 55-year-old patient had a large tumor (8 cm in diameter) in the posterior wall of the middle part of the stomach and treated with laparoscopy assisted local excision using surgical staplers. She developed multiple liver metastasis 6 months after surgery and died later. The resected tumor exhibited high mitotic activity (50/50 HPF) and negative KIT but positive CD34 staining. Recurrence related to laparoscopic surgery, including port-site recurrence, was not observed in this cohort. CONCLUSIONS: Laparoscopic surgery in the management of relatively small gastric GIST (2 < T < 5 cm) could be oncologically validated. Although further investigation is needed, we believe that laparoscopic surgery for GIST of the stomach is feasible both oncologically and technically if treated in high volume centers.